The Soundwatch Boater Education Program is a vessel monitoring and public education outreach program. Soundwatch has been run by The Whale Museum (TWM) during the whale watch season (May through September) in the Haro Strait Region of the Central Salish Sea since 1993. 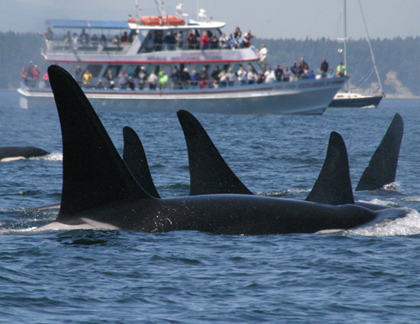 The program compiles data on vessel types and vessel interactions with marine mammals with a focus on the Southern Resident killer whale (SRKW), Orcinas orca, which was listed as endangered under the U.S. Endangered Species Act (ESA) in 2005. Since 1998, the number of active commercial whale watching vessels has increased over time and the number of vessel incidents or violations of regulations and guidelines from all types of vessels have increased. Soundwatch collected data on 23 incident types. The most common regulation/guideline incidents over the 18 years were “Within 880 m of Lime Kiln Point Lighthouse” and “Crossing the path of whales”. The results suggest a need for further outreach for effective education and enforcement of whale watching guidelines and regulations in the Central Salish Sea. Seely, E., Osborne, R. W., Koski, K., & Larson, S. (2017). Soundwatch: Eighteen years of monitoring whale watch vessel activities in the Salish Sea. PLOS One, 12(12), e0189764. Elizabeth Seely1, Richard W. Osborne2, Kari Koski1, Shawn Larson1: 1 The Whale Museum, Friday Harbor, Washington, United States of America; 2 University of Washington, Olympic Natural Resources Center, Forks, Washington, United States of America.